Sometimes, things happen for a reason and there’s just no explanation why it happens. Take for example, when I woke up on the wrong side of my bed that day, I decided that the only thing that I could do to make things right – was to have a Tonkatsu. The question is obviously: which Japanese restaurant has the best tonkatsu in Singapore? I am in a rampage mood for tonkatsu. If there’s one thing that I cannot stand — it is settling for second best. Only the finest, the best tonkatsu will do for me. Having tried Tonkichi, Tetsu and Tampopo Japanese restaurant — I wanted somewhere new. That’s when I thought of Tonkatsu Ginza Bairin at Ion Orchard. Among the Ion Orchard Restaurants, Watami and Itacho Sushi are always crowded, so I easily convinced my lazy partner to the less-crowded Tonkatsu Ginza Bairin. Even though the tonkatsu specialty restaurant is not as busy as the other two Japanese restaurants in Ion Orchard, it is not to say that they are not as good. Tonkatsu Ginza Bairin was actually the first Tonkatsu restaurant in Ginza, establishing in 1927 – that’s a lot of years! Tonkatsu Ginza Bairin is located at the basement of Ion Orchard beside the food kiosks. For a second or two, I was momentarily stunned by their comprehensive selection of tonkatsu items on the menu. After a quick scan, I went for the Kurobuta tonkatsu set ($18.4). By the definition of Brad’s dictionary: a good tonkatsu is deep-fried to a handsome shade of golden brown, coated with million little bits of bread crumb that threaten to spill all over the table. It is sliced appropriately into even sizes, with a thin layer of fats hiding just beneath the crust, occasionally revealing glimpses of the oil that they are fried in. It is sinful, yet not too oily, deep-fried while retaining the juicy and succulent meat under the shattering crisp.It is something that I love and hate, the thing that makes me breathe and its appearance on the table suddenly makes the world a better place to live in. I’m not sure if it’s because I took a longer-than-usual-time to capture the tonkatsu in its glorious state, but it wasn’t as crackly nor juicy as a good tonkatsu should be. By all accounts, it wasn’t too bad. A tonkatsu’s still a tonkatsu, and it was of decent quality. But this, is definitely not the best tonkatsu in Singapore. She went for the Cheese Fillet Curry set ($14.5). 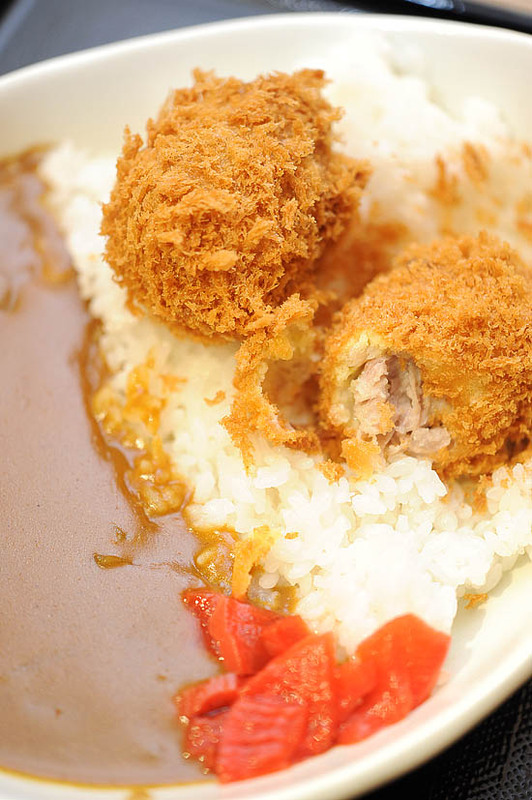 With crispy edges and a cheesy melting center, the fillet ball became something complex yet comforting upon contact with the sweet Japanese curry. It was a shame that there wasn’t enough of the cheese within the fillet, otherwise it would be complete. The truth is: I wanted Tonkatsu Ginza Bairin to be good. I want a restaurant in Orchard where I can satisfy my tonkatsu cravings without spending half an hour queuing up. For those of you who have tried them before, am I wrong to say that it’s not the best Tonkatsu in Singapore? Tell me I am wrong, and I will go back to try their katsu again. I actually love their katsu don. and my wife loves the curry version. I went there before earlier this year. Nothing fantastic in my opinion either. I had the Tampopo tonkatsu ramen during my recent SG trip and it was alright. They are having a 1st anniversary promotion now, with discounts up to 50%. It was great meeting you and the other food bloggers for dinner during this trip! Made my evening, certainly. I think so too, I was so disappointed with their tonkatsu… it was just hard and dry… lacking the juicyness and the yummylicious of fat. Tonkichi and tampopo win hands down anytime^^ so please don’t waste another trip there! maureen: Lets go somewhere else! haha any suggestions? tootall: Ooh really? I love katsu don! Claudia: Cheers. 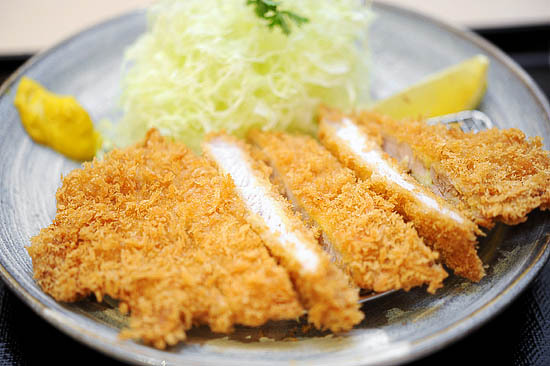 Where do you go for the best tonkatsu in Singapore? LFB: I know! keropokman just blog about the 50% offer, so tempting! Grace: yea tonkichi and tampopo are really good right? Yay to the best tonkatsu in Singapore! cerechu: hahahaha thanks for the recommendation, hope to go back Sydney soon! Fully concur with you, LIC… i dun think very highly of their stuff after my 1st trip there. Very much prefer Tonkatsu or Tampopo. The black pig katsudon is definitely a disappointment. It doesn’t even taste like black pig. The meat is fatty and tough with tendons. It’s also soggy when they put it between the rice and egg. Considering that the shop has a rich history in Tokyo, this is unforgivable. Not going back there again.